In the margins of the pond we grow two irises. 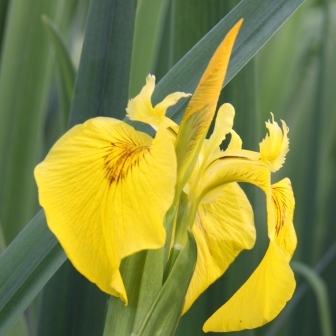 The tallest at more than a metre high is Iris pseudacorus, our native yellow flag iris. It has clear yellow flowers in May and June and dense foliage for around ten months of the year. A pair of moorhens build their nest in this iris every year using last years faded leaves to raise the nest above the water level. Iris versicolor flowers at the same time. Known as the blue flag iris, it’s a much shorter plant, usually around 50cm tall and not nearly as vigorous. But very beautiful. A closely mown lawn may look attractive to us but it’s like a desert for many wild creatures. We let the grass and buttercups grow at the edge of our pond for several reasons. To provide shelter for wildlife emerging from the pond. Grasses and wildflowers grow tall and their flowers provide food for insects and other creatures. And last but not least… it’s less work and looks absolutely beautiful.